ECCI Trackstar 6000 – The King Of Racing Wheels | OhGizmo! If you’re serious about racing games on your PC then it’s time to upgrade that old Logitech or Mad Catz steering wheel. Behold the Trackstar 6000 from Extreme Competition Controls Inc., which boasts a 13 1/2 inch two-tone leather steering wheel (with swells at 10 and 2), a fluid damped steering system that better emulates the effect of tires on pavement, state-of-the-art shift paddles that have apparently been sold to actual drivers looking for a semi-automatic gear shift system and a new clamping mechanism that takes up 25% less desk space than its predecessor. And if you think the Trackstar 6000 looks too awesome to be highly affordable, you’d be right. The base package which includes a two-pedal unit but cheaps out with a molded black vinyl steering wheel will set you back $989 while the top-of-the-line GTS package which includes the leather steering wheel and a three-pedal unit is $1,398. Holy crap, that's one expensive steering wheel! You've got to really, really, I mean reeeeaalllyyy like racing games to buy that sombitch. 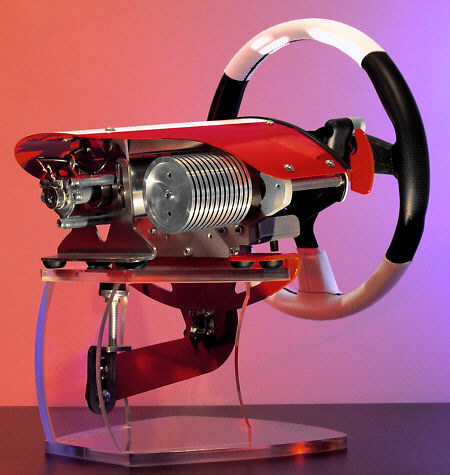 I think that is the most luxurious controller for racing games! I mean, what the heck, one grand for a controller that you will use just for racing games! lol Anyways, thanks for sharing the information about this here.